View More In Color Additives & Fillers. Added goodness of henna, Amla, Shikakai, & Bhrinaraj for total grey coverage. 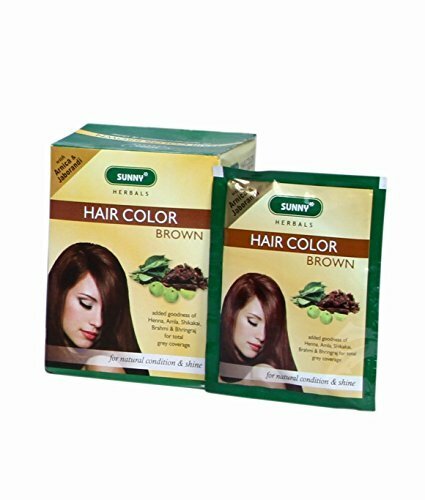 Sunny herbals hair color brown is a unique blend of henna and other essential herbs to color grey hair with the goodness of nature. It pentrates every strand and colors from root to tip giving a long lasting protection and total grey coverage. Contains: henna powder, barium peroxide, para amino phenol, citric acid, brahmi powder, bhringraj, amla powder, shikakai powder, arnica powder, jaborandi powder, sodium sulphite. If you have any questions about this product by Baksons, contact us by completing and submitting the form below. If you are looking for a specif part number, please include it with your message.